Download a 30 day trial version of Mailtraq Professional 50-user to evaluate in your organization. 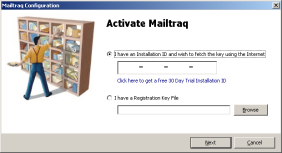 The trial download is a fully functional version of Mailtraq, so you can fully configure it and use it in a live scenario. This trial does not put any branding on messages, and acts just as the fully licensed product, apart from the 30 day time limitation. The trial includes the optional Web Access Control (Proxy). 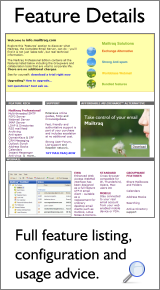 This edition of Mailtraq is a free four-user version of a recent Mailtraq Professional edition. It provides full functionality, and has no time limit on its use. This offers Home users a world-class email server - for no cost. If you choose to upgrade to a full license you can retain all your configuration settings, the branding line is removed, and you can increase the number of users.